Nobody knew where Randyford was, for a long time I believed Randyford was the same as Woodburn Park which was a Junior ground in the Modern Day Boag used by several minor teams in the 1890s. But I have been convinced otherwise. The term Randyford means little in modern Falkirk parlance, but is mostly guided by Randyford Street in the Boag [which I might as well add runs parrallel with the Grangemouth Rd. But to understand Falkirk Football Club in 1878 we have to understand Falkirk in 1878. The earliest I can reel it back without going too far is the map of Falkirk created for the Great Reform Act of 1832. There, on the Grangemouth Road is the Randyford Farm. The next record of Randyford is in Scotland's record Books. "A farmsteading one storey high. slated and in good repair Property of William Forbes Esq. Callendar Ho [House] Falkirk"
I mean I can't prove Falkirk FC played here. Now there is no doubt that both Falkirk & East Stirlingshire played at Randyford [historical record], but this does not tell us where, then the actual ground was. The letter resolves some issues, but also raises some, for example the dates are wrong. However, given that this letter was published some 65 years after the very facts we can give a bit of leeway on the odd year. 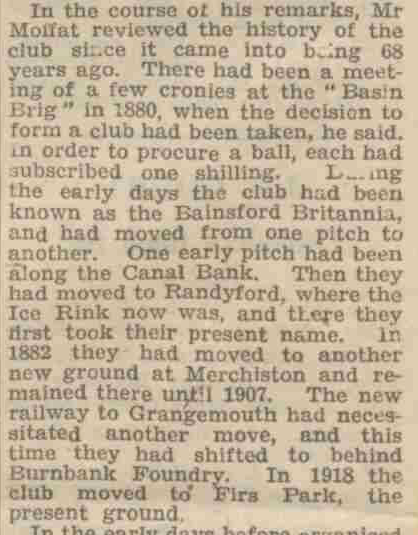 The most important fact is that a player then states what was there in 1948, "where the Ice Rink now was [sic]" This places Falkirk & East Stirlingshire Ground North of the Grangemouth Road and between the Burn and the farm track to Middlefield.